Taste test: These are good wide-rippled ranch chips. 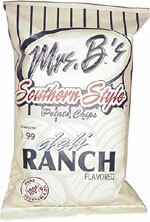 They have a very creamy taste with a nice but not overpowering ranch flavor. Smell test: Smells mostly like potato chips, with a very mild ranch aroma.